"The first time I saw Cindy's "linen quilting' was on the brochure for her class at Asilomar Empty Spools Seminars. I gasped for breath at the beautify of her class sample...and then promptly decided that was just TOO HARD, and signed up for another class! A few months later I got brave enough to sign up for Cindy's class on linen quilting at the Road to California Quilt show but I brought a cheap piece of linen in case I ruined it. Not surprisingly I never finished that project but the bug had bitten! I fell into some bad habits and took to stalking linens on Ebay. So when I signed up for Cindy's Linen Quilting workshop in Rancho Cordova, CA I brought a beautiful Madeira linen table runner and I was eager to work with it. Oh boy was it fun! I named the piece "Elizabeth's Legacy" in honor of Elizabeth Phelps who introduced embroidery tot he ladies of Madeira in the last half of the nineteenth century beginning a cottage industry that would create the finest embroidered linens of their kind. And best of all -- I finished it! My little runner has been on quite a journey -- it hung in the Road to California show, then journeyed to the Midatlantic Quilt Festival in Norfolk , VA. 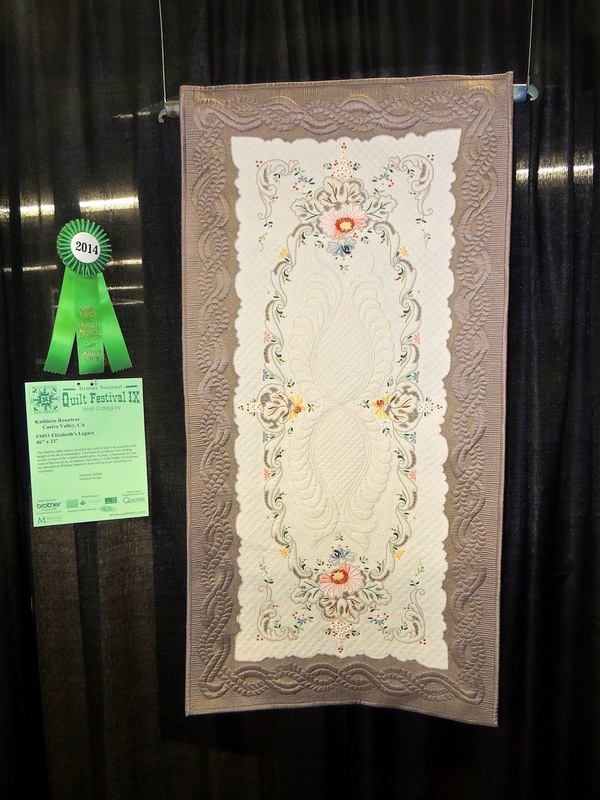 The above photo shows it hanging at the Denver National Quilt Show where it won an Honorable Mention. Next it will be traveling to the AQS show in Columbus, OH. Soon it will have its own frequent flyer account! If I wasn't hooked on linen quilting before I am over the top now...and am finishing up a couple more pieces of linen quilting. Thank you, Cindy, for introducing this beautiful form of quilting. I have always loved vintage linens...to be able to sew on them is just fabulous. I often think of the person who did the original embroidery and speculate on how surprised she would be to know we are giving her gorgeous handiwork a brand new life". Wow, this was so great. Congratulations to Kathleen. Thank you so much for a beautiful "share". Cindy, you have inspired more people than you'll ever know (myself, being one of them!). That linen piece is exquisite!!!! Wow - congrats Kathleen! Wish now I would have gone to the show in Denvver. Gorgeous. Absolutely Gorgeous. Congratulations Kathleen.